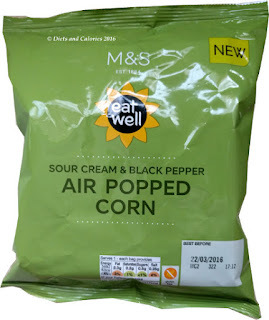 While browsing around Marks and Spencer recently, I thought it about time I took a look to see what sort of ‘healthier’ type packet snacks they have these days. It turned out there were quite a few. 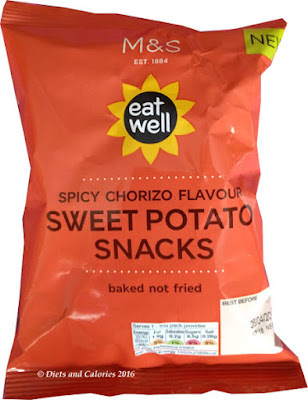 Under the M&S ‘Eat Well’ logo, there is a new selection of alternative crisp snacks, most with less than 100 calories per packet. I purchased a few for review purposes and made a note of the others on display. 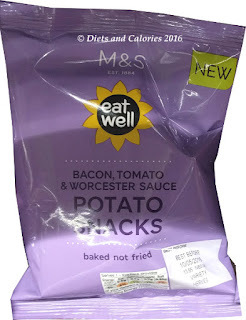 M&S Eat Well Bacon, Tomato & Worcester Sauce Potato Snacks: 102 calories. 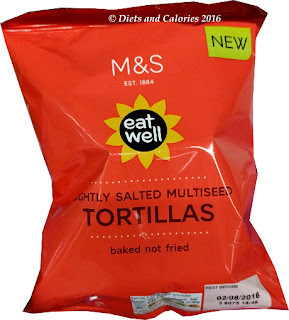 M&S Eat Well Multiseed Tortillas: 155 calories. 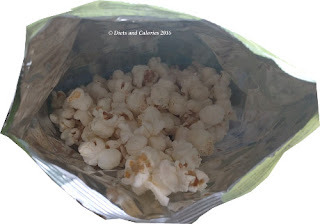 The two packs of popcorn were shared around the family. All agreed the Sour Cream & Black Pepper was the tastiest. They had an almost creaminess to them which was nicely offset by the black pepper. 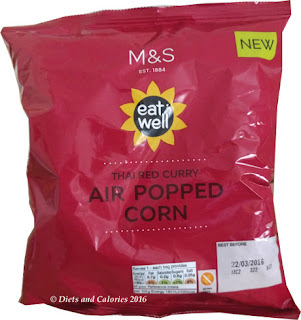 I thought I might like the Thai Red Curry, but the popcorn wasn’t well covered and the spiciness was a bit too sweet for me. I loved the Sweet Potato snack. These are a baked potato snack, really spicy and quite chewy which I found made them filling and satisfying. 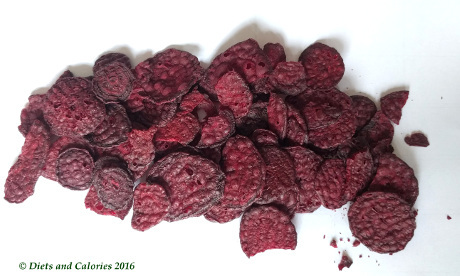 The Beetroot crisps are dehydrated and reminded me at first of the Beetroot snacks I reviewed from Morrisons. 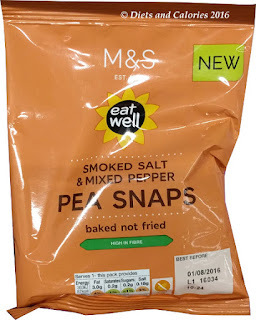 While they look and sound like the Morrison’s brand, they didn’t taste like them. Yes, you can hear them! 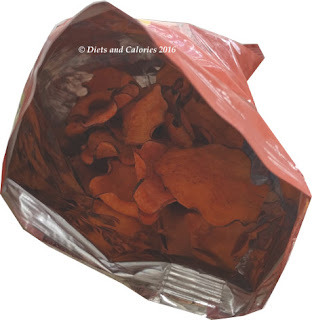 Shake the bag and they sound like a bag of counters. They’re very crunchy and have quite a tang to them. This is from the vinegar. Again, I found them filling and satisfying. The Beetroot crisps are high in salt and sugar, however this isn’t from any added nasties. Beetroot are naturally high in sodium, so in dehydrated form, it’s concentrated. 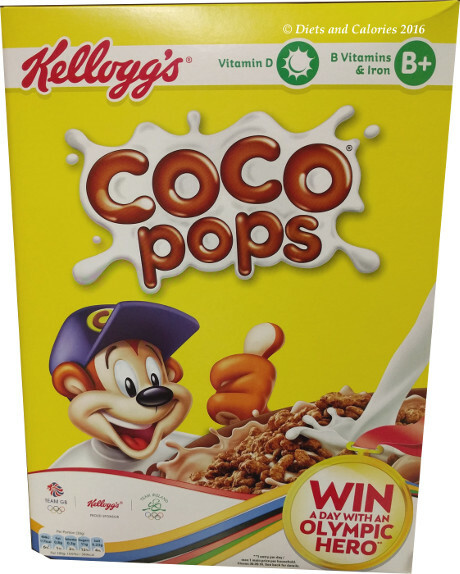 They’re also a sweeter veggie, like carrots, so have a higher natural sugar content. You can find these snacks in branches of Marks & Spencer Foodhalls. 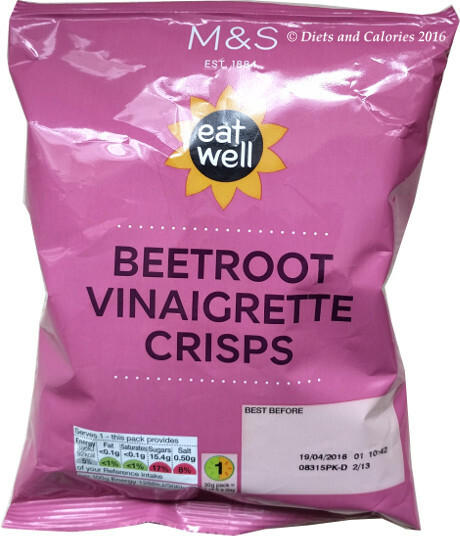 Ingredients Beetroot Crisps: Beetroot, vinegar, cider vinegar, concentrated lemon juice, black pepper extract, dried garlic. Ingredients Sour Cream Popcorn: Popcorn (78%), rapeseed oil, maltodextrin, salt, dried soured cream (milk), dried onions, sugar, dried garlic, dried yeast extract, dried whey (milk), dried parsley, dried skimmed milk, spiced (cracked black pepper, ground cayenne pepper) dried buttermilk, flavouring citric acid, herb extracts (parsley, dill). 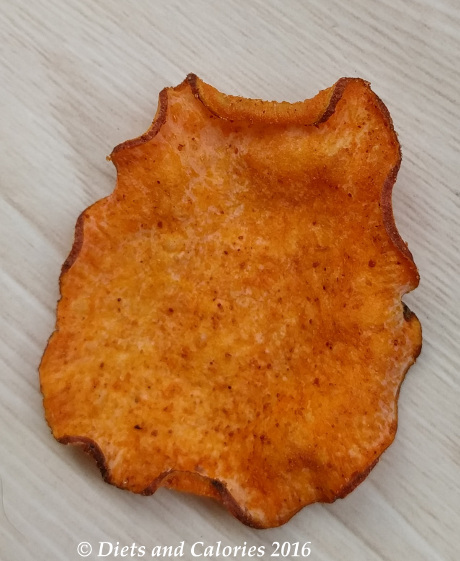 Ingredients Sweet Potato Crisps: Sweet potatoes, sunflower oil, ground spices (cumin, paprika, cayenne pepper), rice flour, dried yeast extract, salt, sugar, dried garlic, dried onions, flavouring, smoked salt, dried oregano, colour: paprika extract, dried chillies, rosemary extract. Ingredients Thai Red Curry Popcorn: Popcorn (77%), rapeseed oil, sugar, dried whey (milk), salt, ground spices (coriander, cayenne pepper, cardamom, cumin), rice flour, dried garlic, dried onions, dried yeast extract, dried herbs (bay, parsley), acid: citric acid, flavouring, colour: paprika extract, curcumin. 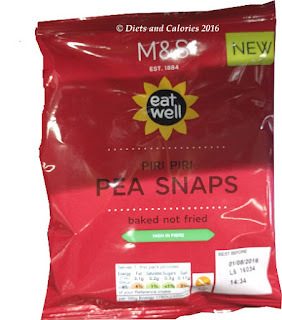 Ingredients Piri Piri Pea Snaps: Marrowfat peas (72%), rapeseed oil, rice flour (8%), dried onions, salt, dried garlic, firming agent: calcium carbonate, sugar, ground spices (Jalapeno pepper, cayenne pepper, cumin), acid: citric acid, yeast extract, maltodextrin, flavouring, dried oregano, dried thyme, colour: paprika extract, capsicum extract, cumin extract, Jalapeno pepper extract, lemon oil, antioxidant: E392. Ingredients Smoked Salt & Mixed Pepper Pea Snaps: Marrowfat peas (72%), rapeseed oil, rice flour (8%), salt, yeast extract, ground spices (Cayenne pepper, fennel seeds, white pepper, cardamom, cinnamon, cloves, ginger, star anise), maltodextrin, firming agent: calcium carbonate, tomato powder, dried garlic, dried onions, flavouring acid: citric acid, smoked salt, sugar, black pepper extract, capsicum extract, pink peppercorn extract, vinegar, antioxidant: E392. 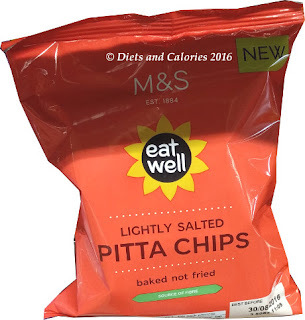 Ingredients Pitta Chips: Wheatflour contains gluten (with wheatflour, calcium carbonate, iron, niacin, thiamin), rapeseed oil, dried yeast, salt, sugar. Ingredients Multiseed Tortillas: Maize flour, rapeseed oil, golden linseeds (2%), salt. Nutrition per 30g bag: (Beetroot crisps): 92 Calories, less than 0.1g fat, less than 0.1g saturated fat, 15.4g carbs, 15.4g sugars, 6.6g fibre, 4.1g protein, 0.50g salt. Suitable for vegetarians. 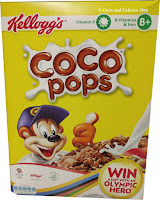 1 pack = 1 of 5 a day. Nutrition per 23g bag: (Sweet Potato crisps): 85 Calories, 1.9g fat, 0.2g saturated fat, 13.6g carbs, 8.5g sugars, 3.2g fibre, 1.9g protein, 0.28g salt. Suitable for vegetarians and vegans. Nutrition per 20g bag: (Thai red curry popcorn): 86 Calories, 2.7g fat, 0.2g saturated fat, 11.3g carbs, 0.6g sugars, 3.0g fibre, 2.7g protein, 0.25g salt. Suitable for vegetarians. 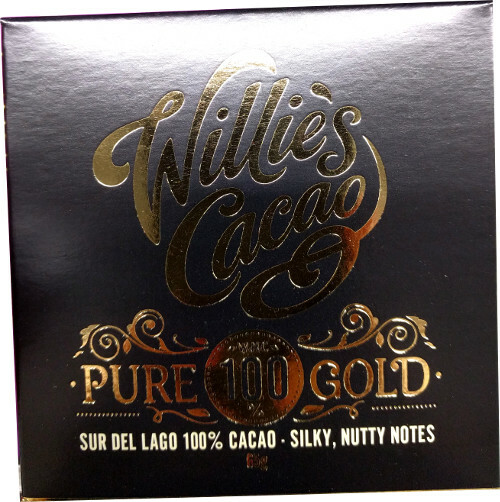 Not suitable for nut allergy sufferers. Gluten Free. Nutrition per 20g bag: (Sour Cream popcorn): 82 Calories, 2.3g fat, 0.2g saturated fat, 12.0g carbs, 0.5g sugars, 2.9g fibre, 2.0g protein, 0.25g salt. Suitable for vegetarians. Not suitable for nut allergy sufferers. Gluten Free. Nutrition per 21g bag: (Piri Piri Pea Snaps): 89 Calories, 3.1g fat, 0.2g saturated fat, 10.3g carbs, 0.3g sugars, 2.6g fibre, 3.7g protein, 0.17g salt. Suitable for vegetarians. Not suitable for nut allergy sufferers. Gluten Free. 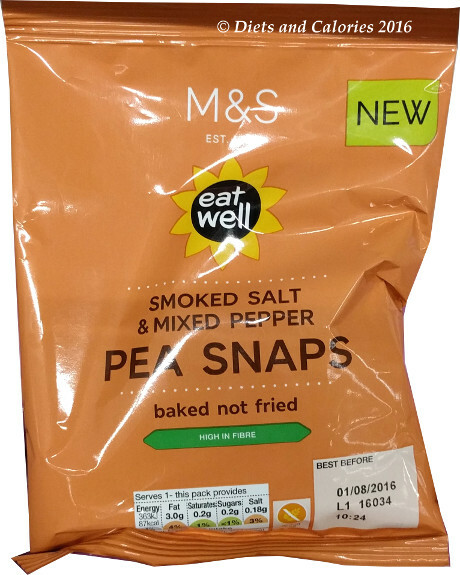 Nutrition per 21g bag: (Smoked Salt and Mixed Pepper Pea Snaps): 87 Calories, 3.0g fat, 0.2g saturated fat, 9.9g carbs, 0.2g sugars, 2.6g fibre, 3.7g protein, 0.18g salt. Suitable for vegetarians. Not suitable for nut allergy sufferers. Gluten Free. Nutrition per bag: (Pitta Chips): 152 Calories, 4.6g fat, 0.4g saturated fat, 12.2g carbs, 0.8g sugars, 3.0g fibre, 4.2g protein, 0.28g salt. Suitable for vegetarians. Nutrition per 35g bag: (Multiseed Tortillas): 155 Calories, 5.4g fat, 0.5g saturated fat, 23.0g carbs, 0.3g sugars, 2.5g fibre, 2.5g protein, 0.30g salt. Suitable for vegetarians. Not suitable for wheat allergy sufferers or coeliacs.